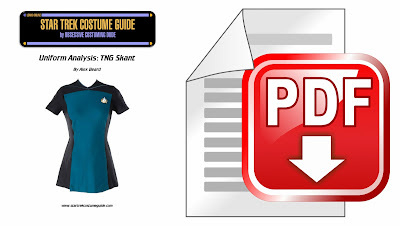 Star Trek Costume Guide: TNG skant analysis PDF added! My TNG skant analysis is now available as a free PDF download! Download my free TNG skant analysis PDF here! Note that because of the large file size, you might not be able to view the PDF online; it may only work as a download. Also, I'm putting the finishing touches on our (Bad Wolf Costumes) TNG skant sewing patterns, and they'll be available soon! Remember to join my "Costume Guide" e-mail newsletter (if you haven't already - upper right corner) for updates and a 10% discount off all Bad Wolf Costumes sewing patterns and pattern bundles!